It’s time for another Cute Outfit Ideas of the Week! Today is number 53 and I’m featuring summer dresses. I don’t know about you, but I definitely have summer on the brain. You guys loved my 37 Cute Outfit Ideas for Summer from last week, so I’m guessing summer fashion is something you’re thinking about as well! I’ve been browsing through Pinterest, Amazon (I NEED/WANT this dress in my life) and a few of my other favorite shops, looking for summer dresses to add to my wardrobe. How many did I find? 576,491,908 Sigh. I narrowed it down to four and paired them with a few accessories. I went very minimal on the accessories and focused on the star of the show – SUMMER DRESSES. Enjoy these cute outfit ideas! There are some great sales going on right now on summer dresses, so look for a few towards the end. This Navy Blue Dress caught my attention because one, it’s only $13 right now and two, I love navy and brown together. It’s one of my favorite classic looks. I’ve seen a similar dress all over Pinterest and I knew I had too find one like it and I did! Plus, this one is only $19.50. Sweet! The pattern is stunning isn’t it? I love maxi dresses and I love florals – so this dress is a win-win for me. Have you shopped at ModCloth before? Hop on over there and browse around. I love everything about this online shop, from the way they display positive body image to their collection of well, everything. They have some of THE best dresses on the internet. Hands down. Have you ever worn or tried on a tee dress? I am absolutely head over heels in love with this one from Madewell. This is one of those outfits you can throw on at the last minute and look like you really thought out what you were going to wear. 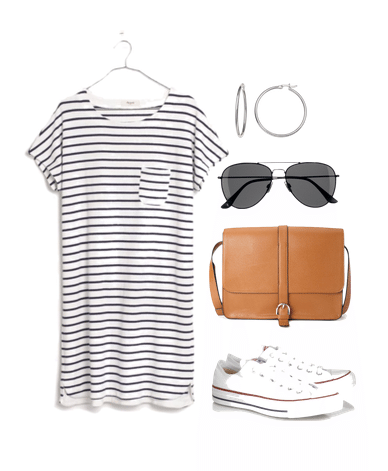 Pair this dress with Chuck Taylors or cute sandals and you’re ready for day of running errands, shopping or a casual date. As I mentioned, here are those sale summer dresses. They are anywhere from 30% to 60% off and they’re all just gorgeous. Polka-dotted Faux Wrap Dress — Such a cute dress for work or play! Ribbed Stripe Dress — Trendy, horizontal, ribbed stripe dress with its fit and flair silhouette will keep you in style for any occasion this spring. See more dresses on sale HERE. Did you enjoy today’s cute outfit ideas feature? What would you like to see next? Let me know! I adore the black dress with wedges & the stripes with sneakers. SO CUTE!!! Thank you Andrea! I need that striped dress!